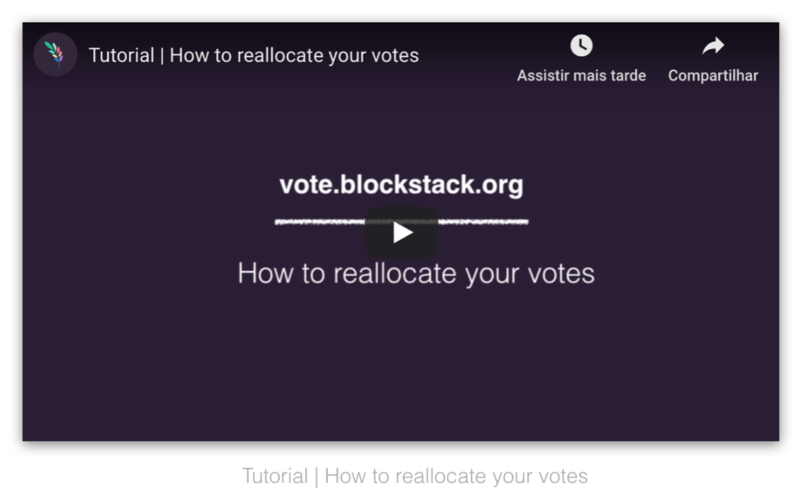 Democracy Earth developed the vote.blockstack.org site for voting on applications in the App Mining program. The votes cast through Democracy Earth are consumed by App Mining’s ranking algorithm and so affect the final ranking of applications each month. Democracy Earth is a platform for borderless peer-to-peer democracy. Every aspect of vote.blockstack.org is thoughtfully designed with an understanding that governance is about enabling rich exchanges of information. The goal is to surface the optimal collective intelligence of a network. Two categories of people participate in the voting process. Application miners who have submitted their application for mining are one category. The other people in the process are Stacks token holders who have asked Blockstack for voting privileges. Stacks token holders vote applications up or down; miners respond to questions about their applications. Important: Blockstack may ask token holders to become voters or token holders may request an invitation to vote. If you are a token holder and would like to become a voter, email mining@app.co for more information. Of course, token holders that are also application miners are not eligible to vote. When token holders accept the voter responsibility and become a voter, they receive 1000 lifetime votes. App Mining rewards are distributed every month at the end of the month. So, voters must vote each month before the distribution. You can expect to review and vote between the start and end of each month. Votes are a valuable resource. They ultimately help shape the future of blockchain development by directing financial support to innovative development efforts. As a voter, you are expected to review each application and speak with the app developers. This evaluation is similar to the evaluation process of any early-stage angel investor. After evaluating applications, you can distribute some or all of your 1000 votes. You distribute votes by voting an application either up (approval) or down (disapproval). You can take votes you bestowed the previous month on one application and give them to another. Of course, if none of the applications are up to your standards, you can abstain from voting entirely that month. Choosing how to allocate votes for a monthly payout of 100k is not a trivial task. To help voters learn more, each app has a Debate section where voters and app miners can interact with each other. Questioning and constructive feedback are enormously insightful input for app miners. Voters are encouraged to inquire and provide feedback as much as possible. Similarly, app miners are encouraged to introduce themselves, explain their goals, their applications, and share more about their work. Remember, everyone’s joint goal is to build an application ecosystem where all users control their data. New applications are added to Democracy Earth at the start of every month. All new apps added to Democracy Earth are highlighted with a New badge so voters can easily spot them. Apps from a previous month remain eligible for voting. This means the pool of applications expands each month. The reason for this is that applications are evolving products, they evolve the quality or expand their features. A product you thought wasn’t so good could make a giant leap forward from one month to the next. Applications appear in a randomized order so all can receive equal attention from voters. Every month, all voters receive a newsletter with updates related to App Mining’s vote. The newsletter contains additional timing-related reminders. If you are a voter make sure you add appmining@democracy.earth to your contacts list. This prevents the newsletter from going to your Spam folder. Use the platform to talk (debate) to application miners and to vote on applications. At the 15th of ever month, votes are tabulated. Once a vote is cast, the vote goes onto the ledger for that app. It stays on the application until you remove it by reallocating the vote. At the end of every monthly cycle, each application has a certain amount of upvotes and downvotes. Blockstack uses votes to calculate a likability score and a traction score for each app. For example, an app with 90 up- and 10 down-votes has a likability score of 80. A traction score ranks how many total votes (including downvotes) an app received, relative to other apps. Both scores are inputs into the ranking algorithm used by App Mining. voter Use the same email you use when communicating with Blockstack about your tokens. app miner Use the email you provided when submitting your application to App Mining (app.co site). Democracy Earth supports authentication with a Blockstack identity. When you authenticate into the site, it builds a profile using the email associated with your Blockstack ID. If for some reason you can’t recall the proper email or the email that appears in your profile does not match the email required to vote, don’t worry. You can change that email later after you create a profile. Display the login drop down. Agree to the App Mining Voting Terms. Select the Blockstack ID button. The system prompts you for a blockstack identity. You may be already signed into the Blockstack Browser with an identity; you can use this one or another. If you do not have a Blockstack identity, you should choose to Create new ID, creating an identity can take time. After creating an identity, return to this procedure. Authenticate with a Blockstack ID. After you authenticate, the browser displays the vote.blockstack.org with your newly created profile. When you authenticate, Democracy Earth sends a validation email to the email address associated with your Blockstack ID. Locate the email that was sent to you. The yellow verification message is no longer visible on your Democracy Earth profile. Decide whether your profile should use a pseudonym. As an application miner, you want to represent your application to voters and so, you should not use a pseudonym. You use your profile to interact with voters. You’ll answer questions or maybe defend your choices to votes. If you are a voter, you may want to use a pseudonym. You can create this by how you complete your profile. Provide a pseudonym and a username not generally associated with your public identity. By default, Democracy Earth initiates the profile with the username portion of your ID, but you can change it afterward at any time . Edit the FIRST NAME, SURNAME, and USERNAME FIELDS in your profile. At this point, you should see your completed profile. If you are a voter, your profile appears with the number of votes you have to cast. Important: If you see that you have NONE instead of a number in the votes section, check and make sure the email in the profile is correct as described in these instructions. If your email is correct, and you still do not have any votes available, email appmining@democracy.earth for help. You are all done setting up your profile. In the future, make sure that if you log out of Democracy Earth that you always log back in with the Blockstack ID you used to set up your profile. Log into the https://vote.blockstack.org/ site. Locate an app to vote on. Applications that are new appear with a New badge. Yes upvotes an application meaning you think is adding value to the future of blockchain ecosystems. No downvotes an application that you don’t think is adding value. Remember you don’t have to choose either, you can merely Debate if you like. Slide the bar appropriately for the number of votes you want to apply. The system displays your identity. Click on the profile photo to edit your profile information. Blockstack’s Slack for application miners with questions. If you have any questions or need help utilizing the platform, you can also reach out directly to appmining@democracy.earth.